The autumn moon is very special to the Japanese feeling of the season. According to the Asian Lunar Calender, after the 16th day of a month, the moon was still in the sky until the dawn of the day. .. .. .. .. MOON and its LINKS..
a special lantern which is kept alight all night until dawn. Daybreak lantern. Day Break Lantern. Bedside lamp. Click HERE to see more of these lanterns . The word "Ariake" means the moon that remains in the sky as morning dawns. Ariake lights, like their name, were left on throughout the night and had a beautiful glow. Each light had a cover, which was a box with a full moon-shaped window on the front and half moon-shaped windows on the sides. When used at night, this cover was placed over the lights, illuminating the moons and weakening the light. If our modern eyes, which are continually surrounded by bright lights, were to look at an Ariake light with its cover on, we would see only a faint glow and may not appreciate it. 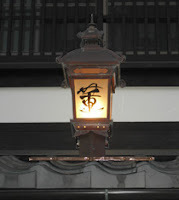 ARIAKEANDON, lights representing the Edo period. 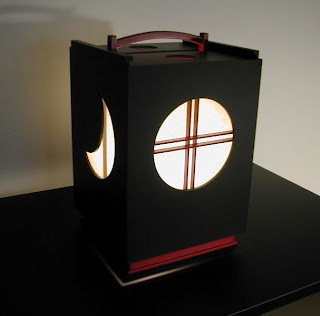 The portable paper framed lanterns are called andon. framed light chamber conceals an oil dish. The paper diffuses the light -33 created within to soften the harshness of the bare flame. It is believed that the advent of the shoji (papered sliding doors) in Japanese interiors was an epochal event in the development of Japanese lighting. Shoji provided the concept of diffusing a light source. In the daytime, these doors provided a shield against the harsh rays of sunshine, but still permitted adequate light into the interior. The same principle is applied with andon. They shield the bright flame providing the ethereal lighting effect desired in Japanese interiors.
. 織部行灯皿 andon dishes from Oribe . (15 March 1876 – 3 February 1952) was the pen-name of a Japanese poet and novelist active in Taisho and Showa period Japan. Ariake offers up the passionate words of the elegant and cultured female courtesans of ancient Japan. 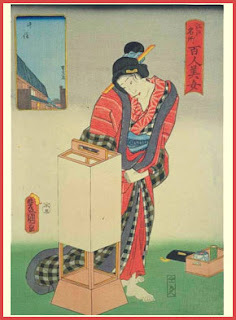 It was customary in the late 1st and early 2nd century Japanese courts for women to express their hearts' greatest desires and sorrows through poetry. Translated and compiled in Ariake, these lyrical and poignant verses of seduction, love, and lament are both simple and extraordinary. Illustrated throughout with gorgeous collages that evoke the color, fabric, and textures of the East, Ariake brings to life the subtle eloquence of ancient Japan and the universal passions and torments of love. Ariake is an exquisite and timeless volume of the heart's longing. was an image associated foremost with love in the ancient courts of Japan. Two lovers, absorbed in their passion, knew that when the dawn moon floated toward the western hills, they would soon have to part. The man might fumble in the dim light, looking for his fan; the lady might straigten his robes and smooth his hair. In the sky, the pale moon hovered before disappearing over the horizon." rin is a Buddhist prayer bell. Beginning with the 13th day of Eleventh Month and continuing for 48 days thereafter, certain Buddhist priests went on pilgrimage each night, reciting the nembutsu and singing religious songs. Since they had to beg for food along the way, they announced their presence and need by banging on their bowls. The nembutsu prayer is "Namu Amida Butsu"--"All praise to Amida Buddha!" This haiku refers to the making of a snow Buddha. Read more of Issa's dawn haiku here ! closer, to the end . . . This hokku was written on 6/2 (July 20) in 1803, when Issa was in the area just to the east of Edo. In his diary Issa notes that it's the first day of doyou (土用), the 19-day period between lunar summer and autumn, when the earth element grows strong and facilitates the smooth transition between summer and fall. There are similar earth-governed periods between all the seasons, but the summer earth period is the most commonly mentioned, because the weather is usually very hot and often humid. In English the days of doyou are commonly called the dog days of summer. When the summer earth period came, people did "earth days drying" (doyou-boshi): they gradually took all their clothes and books and hung or placed them outside in order to air them out and get rid of insects. Issa doesn't say what kind of housework he's doing, but probably he's put out some clothes and books in the morning, when it was still cool, and the day was so hot he decided to wait inside until after dark to go out and bring them back inside again. Suzumi means going to a cool place to cool off, and usually it implies free time or relaxation, but in Issa's humorous hokku it's his housework that cools him off. It's still hot indoors, where he's probably been working on something (writing comments on his students' hokku? ), but now, as he holds a torch in one hand and cleans up outside, he can finally cool off.
. WKD : Dog Days (doyoo 土用) . 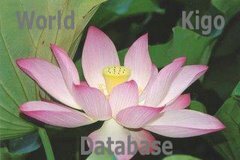 ***** The Asian Lunar Calendar. A Reference ! This hokku is from the eighth lunar month (September) in 1813, the year Issa left Edo and went back to his hometown to live. In September Issa was recovering from a large boil on his hip at the house of one of his students who lived near Zenkoji Temple, not far from Issa's hometown. An ando (or andon) is an oil lamp with a square or round base for the oil bowl and wick and a frame covered with thick, translucent paper surrounding the flame to protect it from wind. The frame usually had a handle at the top so it could be carried and used like a lantern. It could also be placed outside of a house. Perhaps Issa is lying on a mat on the porch, enjoying the cool air and listening to insects. Attracted by the lantern, a green insect stopped briefly near Issa, but it jumped or flew away all too soon, so Issa gives it a warm invitation to stay (泊れ) awhile.